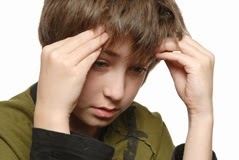 It is normal for a child who (a) experiences periodic anxiety and (b) has a limited ability to soothe himself. Kids with Asperger’s (AS) and High Functioning Autism (HFA) are particularly vulnerable to anxiety. This vulnerability is an intrinsic feature of AS and HFA through specific neurotransmitter system defects, a breakdown in circuitry related to extinguishing fear responses, or a secondary consequence of their inability to make social judgments throughout development. The social limitations of AS and HFA make it difficult for kids with the disorder to develop coping strategies for soothing themselves and containing difficult emotions. Limitations in their ability to grasp social cues, and their highly rigid style, act in concert to create repeated social errors. They are frequently bullied and teased by their peers, but can’t mount effective socially adaptive responses. Limitations in generalizing from one situation to another also contribute to repeating the same social mistakes. Furthermore, the lack of empathy severely limits skills for autonomous social problem-solving. For higher-functioning kids, there is sufficient grasp of situations to recognize that others “get it” when they do not. For others there is only the discomfort that comes from somatic responses that are disconnected from events and experience. In a nutshell, the more anxious the AS or HFA child is, the more he will “act-out” his emotions rather than using more functional methods of discharging the negative energy associated with anxiety. This results in the “bad” behavior that parents see. • Anonymous said... I notice the pants are suddenly half way up his legs. lol. Have asked paediatrician if his testosterone could also be tested when we hit rocky periods, but he believes it has nothing to do with it, but we have put him on Omega that contains evening primrose oil and it has made a huge difference than normal omegas esp with aggression. • Anonymous said... It does have to do with the stress level. Find a Masgutova Core Specialist and you will have a great tool to change his brain. Worked for my child...it would be a miracle except it is based on the last brain research and we did the therapy for several years to get our miraculous results. • Anonymous said... This may sound weird, but our son, not so much now but when younger, use to elevate in behaviour with the "new moon", 3 days prior and 3 days after, asked our paediatrician and he said it's not proven that these kids can change with the luna cycle, but I wsn't the 1st parent to have noticed behaviour change with the new moon, also he use to elevate when going thru a growth spurt and still does. • Anonymous said... To answer your question NO Aspergers does not come and go . Aspergers is under the umbrella of autism if you have it.... You have it for life. • Anonymous said... Was just talking about this! • Anonymous said... We have longer cycles which over the years I think are determined by whether my son is going through either a cognitive or physical growth period. These times we often have very challenging behaviour and when it begins to settle a bit ( could be a month or so later) I suddenly realise how tall he is. Sometimes it's at the end of term always worse at the end of the year and if he's had more stimulation at school. So we have cycles of periods which are harder and it's very stressful during these times which place the family under great strain. * Anonymous said... Yes, my son is 8 1/2. He is on the mild side of the spectrum, and I've noticed since he was a baby that his "symptoms" have peaks and valleys. I've brought this up to our doctor, he didn't seem to feel there was much to this theory, but speaking with other parents who have kids on the spectrum, they all report the same thing. One poosibility is that something is upsetting your child at school, your child is unable to verbalize, and his woes are following him home. Another possibiloty...The rates of ASD in US have increased from 1/10,000 in 1970s to 1/50 most recently. One of reasons is that more variations/presentations are included. It is now a very heterogenous category with at least 300 known genetic contributions. I would encourage you to consider possibility that some yet to be fully understood metabolic and autoimmune disorders are currently labeled as ASD. I think novel bio interventions addressing those possibilities may be worth a try if you yhink they are safe.